So I recently had my big 30th Birthday. It truly was an incredible celebration as I was surrounded by so many of my amazing friends and family. Six of the DIVAs even flew down from Michigan & New York to Florida, in the middle of May mind you, to be with me. Pretty neat, huh? 🙂 We had a really fun weekend of just catching up, laying by the pool, and of course eating and drinking like Queens! In the midst of the big weekend, we threw a Birthday Bash at my condo. And like true DIVAs, no detail was overlooked. I happen to be a sucker for miniature items. 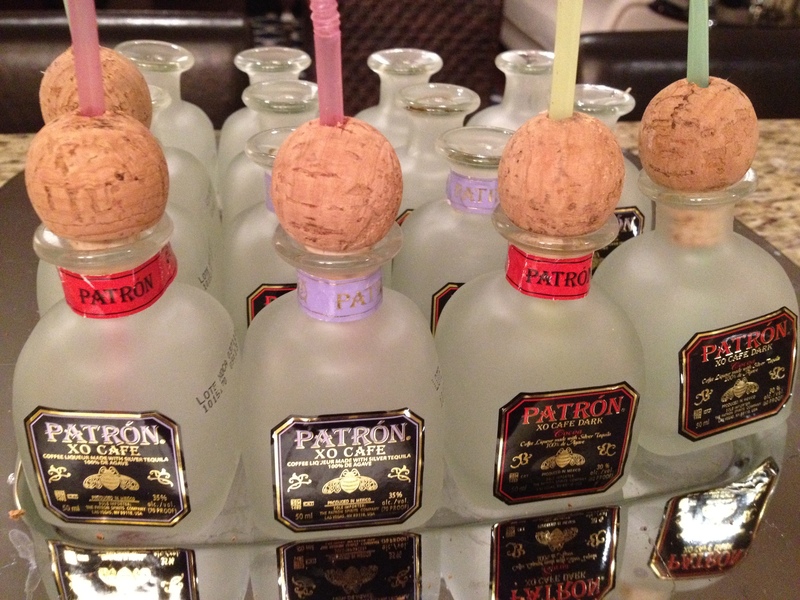 So when I came across an image of Peter Callahan‘s Mini Patron Bottle Margaritas, I knew I had to have them at my party. The original plan was to drill holes through the cork tops, and push straws through the cork. Now this requires a power tool. Me and tools…. well, look at the photo below to see how we pair up, ha. What a DIVA will do for entertaining! 😉 While I did try (thank you to Kelly who loaned me the drill from her office!) and got several done, we simply just ran out of time. We ended up just putting the color straws in the bottle, which worked out perfectly. * Adjust to your serving size and taste (and tolerance!). Each Mini Patron Bottle is about 2 Ounces. To make the Simple Syrup, add 1 cup sugar with 1 cup water in a small saucepan. Stir frequently over medium heat until the sugar has dissolved. Set aside to cool. Either by hand or in a small blender, mix together the lime zest, salt and sugar until well blended. Set aside on a plate. In a cocktail shaker, mix the Tequila, Lime Juice, Simple Syrup and Orange Liquor or Soda water. Shake over ice until chilled. 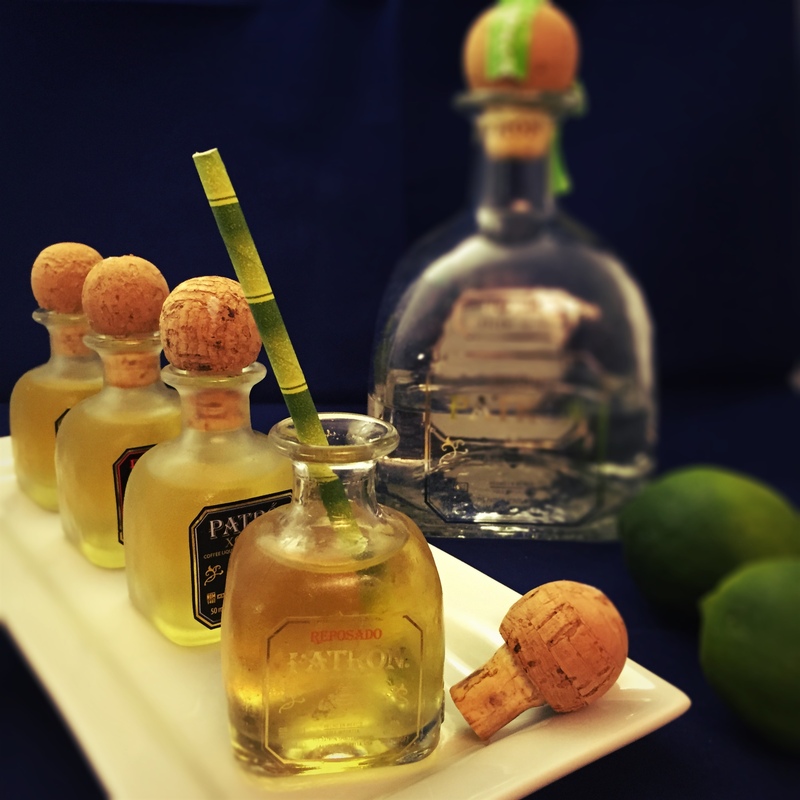 Use a funnel to pour into each of the baby Patron bottles. Cut straws to the appropriate height of each bottle. If you plan ahead and are good with power tools, you can drill a hole through the cork tops, or just place the straws in the bottles. If you opt for just the straws, wet and press the rims of each bottle into the salt/zest/sugar mixture to rim the edges. Display the margaritas on a pretty tray for your guests. Cheers!